Well, that might not actually be true—but that’s how the Lightning may have been feeling last June when they lost in the Stanley Cup Finals to Chicago. The Tampa Bay Lightning are looking to change that this time around. They will host the Detroit Red Wings Wednesday night in the first round of the playoffs. 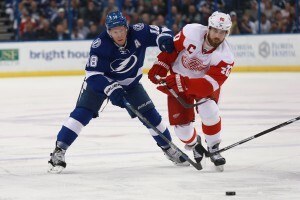 The Lightning faced the Red Wings four times in the regular season, going 2-2. 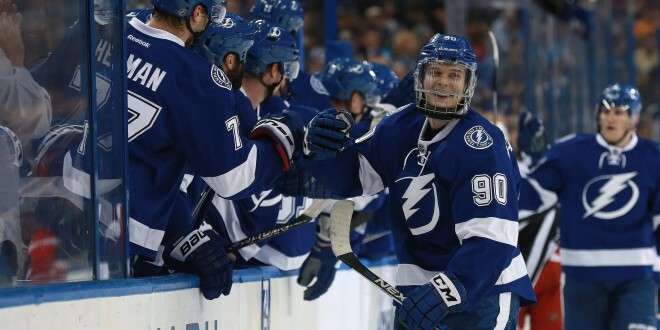 However, during the teams’ last meeting in March, the Lightning beat Detroit 6-2. The Lightning and Red Wings met last year in the playoffs. Tampa Bay eliminated Detroit when they took four of the games. Jon Cooper, Lightning head coach, shared his excitement for the playoffs. The two Atlantic Division teams finished the season with similar records. The Lightning were 46-31-5 in the regular season, and finished second in the division. The Red Wings finished their regular season at 41-30-11 while taking third in the division. Tampa Bay may be down a few key offensive players during Wednesday’s game. The Lightning’s captain, center Steven Stamkos, is out for a few months after having surgery recently for a blood clot. Tyler Johnson is another center who may not be lacing up the skates on Wednesday. His head collided with a board during a shove on Saturday night. 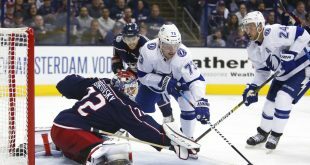 Johnson was allowed to skate on Tuesday, but it is still uncertain if he will be cleared for Wednesday’s game. As for Lightning defense, Anton Stralman will miss the game after a recent leg injury. 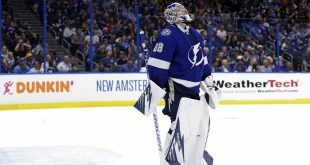 The Lightning will need goalie Ben Bishop to bring his A-game again this year to the playoffs. Last spring against the Red Wings, his was .922 in save percentage during the series. Bishop’s stellar play in last year’s playoffs highlighted the team’s run– or skate— for the cup. At 6’7″, 216 lbs, the tank from Colorado is in the running to win the NHL’s Vezina Trophy this season. The trophy is awarded to the league’s top goalie each year. Bishop is one of the best this season in goals-against average, shut outs, and save percentage. The Detroit Red Wings are hoping rookie Dylan Larkin can sneak a few past Bishop. The 19-year-old leads the team with 23 goals this season. Another Red Wing who could pose a threat to the Lightning is Henrik Zetterberg, who leads the team this season with 50 points. Detroit may be taking a sigh of relief now that Johnson is out. Johnson scored six goals against Detroit in last year’s playoff series. The Red Wings had a solid run early in the season with goalies Petr Mrazek and Jimmy Howard. It’s likely Detroit will start Howard over Mrazek, who played in all seven games last year in the playoff series with Tampa Bay. Danny DeKeyser adds to Detroit’s defense with his strong shutdown play. This season, he has averaged more than 20 minutes a game. With all of Tampa Bay’s injuries, the Red Wings may now have a better chance of winning the series. The Lightning will need to rely on Bishop’s strong play. If Johnson is unable to return on offense, Detroit’s job on defense becomes a little bit easier. Coverage: The puck will drop at 7 p.m. in Tampa. ESPN Gainesvilles 95.3 FM will have the call starting at 6:30 p.m. TV coverage is on NBCSN.